The miseries of the horse carriage industry were on display in a devastating incident Friday morning. 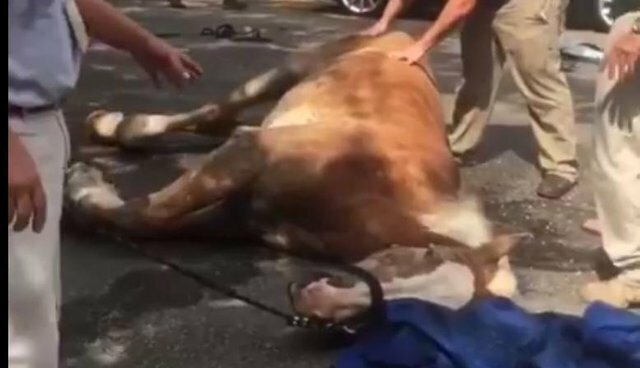 In Charleston, South Carolina, a 12-year-old carriage horse named Blondie spent more than two hours struggling to stand after he fell on a city street. The horse was bleeding and injured on his back legs. With temperatures in the high 80s, spectators began bringing the fallen horse water and giving him an ice bath. "Medic saying the horse is so big it isn't meant to be down on ground for so long like it has," tweeted Woods from the scene. "Its been more than an hr the horse has been on the ground. Nothing seems to be working to help him get up on his feet." So in a dramatic and desperate spectacle - with police blocking off nearby streets- a crane was brought in to lift the horse. Woods tweeted that Blondie began to be more steady with the crane but it was unclear if he could manage to stand on his leg: "back right leg is still bent & hasn't moved at all." The horse's driver - who was crying at one point - began to feed Blondie popsicles. Eventually, Blondie was able to stand without assistance. Meanwhile, Blondie's massive carriage stayed empty on the side of the road. This incident is yet another testament to the cruelty inherent in the horse-drawn carriage industry, which has been banned in cities from Salt Lake City to Biloxi, Mississippi, and from city centers in London, Mumbai, Paris, Toronto, and dozens of other cities around the globe. Charleston should act now and relieve Blondie and dozens of other suffering horses so that they can recover at a reputable sanctuary. Carriage horses are suffering on city streets across America. To learn more, visit PETA's campaign page. UPDATE: Ashley Cline, a representative of the Old South Carriage Co. where Blondie works, told The Dodo on Saturday that Blondie is doing fine after he was monitored overnight at a vet clinic as a precaution, and the company's horses are well-cared for. "We rescue these horses from the Amish country where they are worked 12-14 hour days," she said. "Here in Charleston they enjoy working only 5 hours a day with plenty of vacation time on our 65 acre plantation retreat on John's Island."